We all love chocolate, but few realise that combined with all that sugar, its not really chocolate, but refined white sugar flavoured with chocolate. 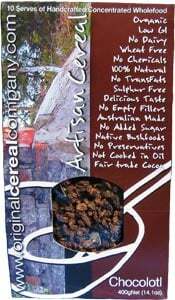 Chocolotl Artisan Cereal is a healthy way to eat the natural goodness of chocolate, which was prized in ancient american cultures as a fortifying and strengthening food...."Food of the Gods", without all the sugar. Our organically grown pure cocoa is combined with the complex, slow-release, sweetness of natural barley malt, South Australian Grape juice, and the ancient sweetener of Biblical fame, Carob. Then flavoured as did the Aztecs and maya, with pure vanilla. We have also added the choc-like essences of ancient Australia, roasted wattle seed, and Kutjera berries, to complete this international flavour feast. All of these traditional foods are rich in anti-oxidants and life enhancing phytonutrients, sadly lacking in modern diets. Combined with the fibre-rich, healthful whole grains, nuts and seeds, of our cereal, what a unique and flavourful, awakening breakfast, or anytime snack. You gotta try it! Our unique formula and process delivers the optimum nutritional content of the ingredients, making them readily digestible and available to vitalise and sustain you throughout the day. Our first preference is to use biodynamic, organic and locally grown ingredients. We are committed to providing support to local Indigenous communities and growers.